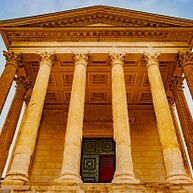 Nîmes is one of the oldest cities in Europe. It is also the city of spring, named after the Roman God Nemausus. In recent years Nîmes has been rediscovered as a weekend destination, thanks to, in large part, its beauty, rich architectural heritage and proximity to both the Mediterranean and Provence. There are also many exciting restaurants in the city, including Aux Plaisirs des Halles by Nîmes’ large indoor food market. Newspapers: There are no local, English language newspapers in Nîmes, but the tourist information office can provide brochures and lend you books about the region. Opening hours: Smaller shops are usually open 09.00 - 12.00 and 14.00 - 19.00. Grocery stores usually stay open 09.00 - 17.00. 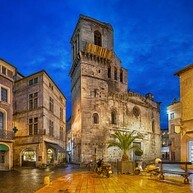 Nîmes a city with two thousand years of history which are displayed around the city with cathedrals, roman temple, amphitheatre, gardens and the medieval market town of Uzès. Here you can wander through streets and squares and look at the historical attractions. You will find plenty of interesting things to do while visiting Nîmes. Despite its relatively small scale, this is a world-class attraction. 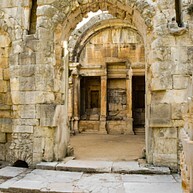 It is the best-preserved Roman temple anywhere. Built in 19 B.C. by Roman emperor Marcus Vipsanius Agrippa, the original patron of the Pantheon in Rome. Notre Dame And Saint Castor is a massive church building from 1096, with a delicate interior that has some of the best examples of Roman sculpture in France. 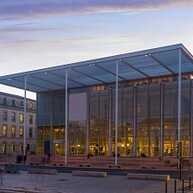 This futuristic glass, steel and concrete palace has the same proportions as Maison Carré. Only a small part of the building is visible, with five of its nine floors underground. Many good exhibitions are held here. This Roman aqueduct is striking in itself. Its size is impressive, but its surroundings help to make it one of the most magnificent structures in France. 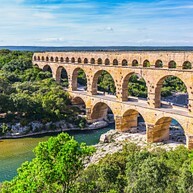 Water travels through it for 31 miles before reaching Nîmes. The Nîmes Arena was inspired by the Coliseum in Rome, built under Emperor Augustus, and is the best preserved amphitheatre of the Roman era in the world. It has seating capacity for an amazing 20,000 people over 34 tiers and is used for bull fights, pop concerts and sporting fixtures. There is also audio guided tours where you can relive the Roman gladiator games. If you have your thoughts on a day trip, this is the perfect one. The medieval market town of Uzès is a treasure. Taken a round trip from Nîmes, including the Pont du Gard (just 20km away), and find yourself wander around antique shops and sit in shady squares sipping coffee. Make sure to see the old ducal castle and the Tour Fenestrelle, a local equivalent of Pisa’s Leaning Tower. This water garden is a must visit when you are in Nîmes. These colourful gardens are located just 10 min from the town centre and is a welcoming, serein place to spend a couple of hours. Feel free to bring a picnic. 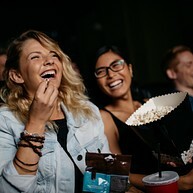 This cinema is not big but it has a large personality. It is a wonderful art theatre which plays low-budget and independent movies which are not shown on other cinemas. 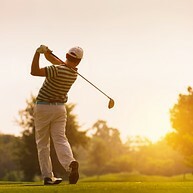 This course is suitable for both beginners and experienced golfers. It offers a 9-hole pitch & putt, putting green, chipping green, two holes of training and 60 practice stations. It invites you to challenging golf time. 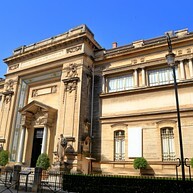 The Museum of Fine Arts holds beautiful sculptures, paintings from the revolutionary confiscations and architecture. Here you will also find many interesting exhibitions all year around. The lower and upper gallery shows paintings from different eras and countries. Parc Panda greets you with a warm welcome and is a great place for the whole family. 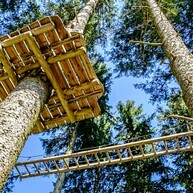 Despite the name, they do not have pandas here but when climbing in the trees you might feel like one. If you would like to get your competitive spirit on and challenge your children or your parents then you should visit Laser Game. It is always tons of fun here! This temple is built sometime during the reign of Augustus and it says that it might have been a library. The building has beautiful vaulted ceilings, big archways and passageways. It is worth a visit. Green Park is the perfect place to spend a whole day with the family. They have a water area with many fun water games, a play area and a small farm with different animals and pony riding.